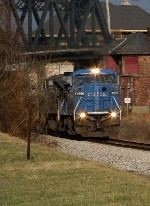 Description: A Dash 8-40CW still in Conrail paint. Description: A collection of locomotives on the Croxton engine tracks. Description: NS 24K with NS 17A in the back at 11:55 a.m. Description: NS 8340 still in her CR Blue leads 16T down track 2 as he passes underneath the 4th St bridge in downtown Emmaus. Title: WB Hot Intermodal Train 21M @ 1015 hrs. Description: NS B-32 clears the signal at CP Alex. southbound for Indianapolis. Description: NS B-32 has bypassed the wye track that connects Marion Branch to the Frankfort District to go south toward Indianapolis. Description: The remains of the former Westmoreland Glass in the background. Description: Eastbound 18G starts the final leg of its journey to New Jersey with a former Conrail unit leading. 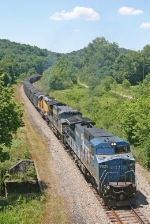 Description: Conrail Blue lead NS train 18G roaring past me at trackspeed! Description: An exCR C40-8W leads 18G, the last train I would photograph on the 1st of July.